On Saturday, December 12, Buffalo State will host the Open Buffalo Emerging Leaders graduation ceremony in the Campbell Student Union Assembly Hall at 4:00 p.m., following a 3:00 p.m. reception at the same location. 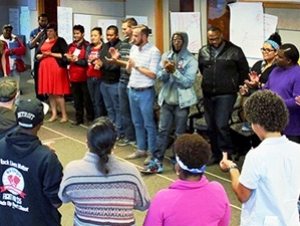 This inaugural class of dedicated community members has been equipped with tools and skills to become strong and effective community organizers and leaders. Kevin Railey, dean of the Graduate School, serves on the leadership development committee for Open Buffalo with John Siskar, senior adviser for Buffalo State Educational Pipeline Initiatives. During the course of the program, Railey also facilitated a workshop based on the model developed by the National Coalition Building Institute (NCBI). Gail Wells, who recently retired as director of student life at Buffalo State, co-facilitated the training and served as a mentor for one of the students in the program. "I see our involvement with Open Buffalo as an example of the kind of community engagement that earned us the Carnegie Foundation’s Community Engagement Classification," said Railey. "Open Buffalo's goal is to promote economic equality and justice, a goal that is certainly in line with Buffalo State's values." Emerging Leaders attracted 125 applicants, and Railey helped to select the 25 participants chosen. "During the vetting process," he said, "we looked for people who not only have a desire for social justice concerns but who also demonstrated a strong commitment to their community. The students come from all over the city—North and South Buffalo as well as the East and West Sides." He noted that Open Buffalo aligns with Buffalo’s “Opportunity Pledge,” which promotes inclusiveness and equal economic opportunities. President Conway-Turner and other Buffalo State administrators signed the Opportunity Pledge when Mayor Byron Brown visited campus in October. In 2003, Railey received the President’s Award for Excellence in the Advancement of Equity and Diversity. Two years later, he received the SUNY Chancellor’s Award for Excellence in Scholarship and Creative Activity. He served as associate director of NCBI at Buffalo State, and has served as associate provost and dean since 2007. "We are very grateful to Buffalo State for the many contributions it has given to Open Buffalo and the entire City of Buffalo," said Franchelle Hart, executive director of Open Buffalo and a Buffalo State alumna. "Buffalo State is an institution that honors and values diversity and inclusion at the highest levels. A special thank you to Dr. Railey and Dr. Siskar for the many hours dedicated to curriculum development, and the generosity with meeting spaces for our students. As a Buffalo State alum, I thank Buffalo State for continued investment into this community." Photo courtesy of Open Buffalo.